WAUNAKEE, Wis. (June 11, 2018) — Yahara Pride Farms, in collaboration with the Farmers for the Upper Sugar River, provided an educational exhibit at the Dane County Breakfast on the Farm held on June 9th at Hensen Bros. Dairy in Waunakee. The “Farmers protecting water quality tent” was an opportunity for farmers in both groups to explain the conservation practices that are currently taking place in Dane County and answer any questions that people had. One of Yahara Pride Farms’ goals is to build relationships with members of the community and help them understand what conservation practices impact water quality in the Yahara watershed. 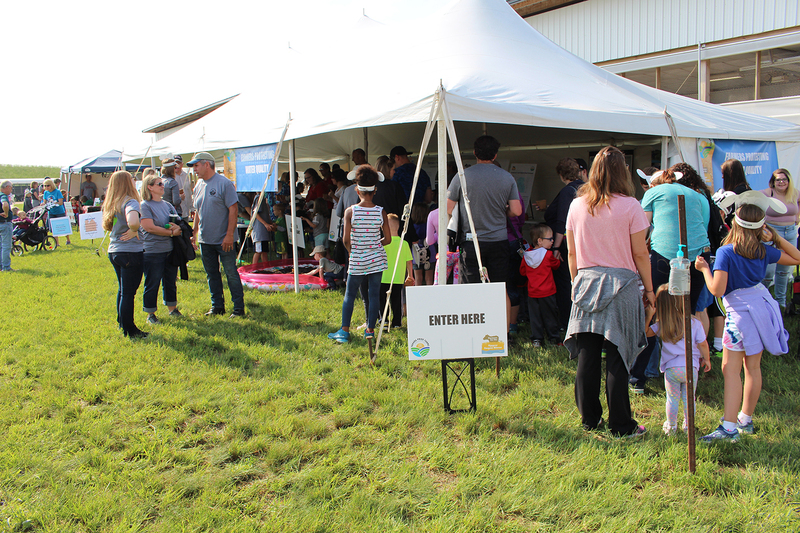 Since Breakfast on the Farm is a big event with large public attendance, Yahara Pride Farms created a fun activity for kids and families to draw parallels between farming and gardening. 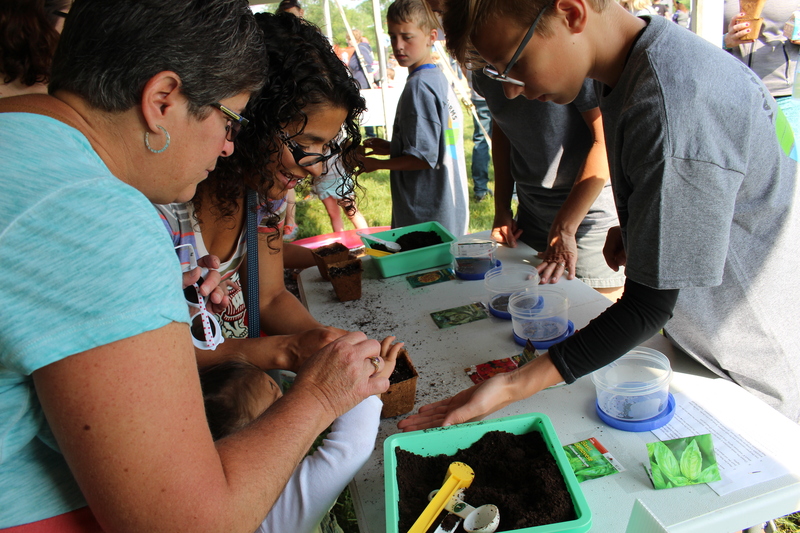 New this year Yahara Pride Farms provided a seed planting station where attendees could plant their own seed to take home. Volunteers sprinkled composted manure on the top of the freshly planted seed and explained the benefits of fertilizing a plant with compost. The activity was a huge success with more than 600 plants taken home to families across Dane county and the surrounding areas. “We want the public to know that we are in this together and we also want a great community to live in” said Scott Maier, a board member for Yahara Pride Farms. This year’s Dane County Breakfast on the Farm was hosted by Hensen Bros. Dairy. Owner Will Hensen serves on the Yahara Pride Farms board of directors. 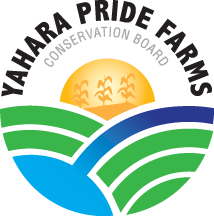 Established in 2012, Yahara Pride Farms is a farmer-led 501c(3) non-profit organization that strives to preserve agricultural heritage while simultaneously encouraging farmers to engage in proactive environmental stewardship within the Yahara Watershed. Participating farms employ practices that result in the preservation and enhancement of soil and water resources for today, and for generations to come. In 2016, farmers in the program reduced phosphorus delivery to Madison lakes and the Yahara River by 11,000 lbs. Since 2012, farmers have documented a total phosphorus delivery reduction of 27,000 lbs. For more information, visit yaharapridefarms.org. Editor’s note: [Photo] Yahara Pride Farms participated at this year’s Dane County Breakfast on the Farm on June 9. YPF volunteer handing out seed – More than 600 attendees planted seeds in the farmers protecting water quality tent. 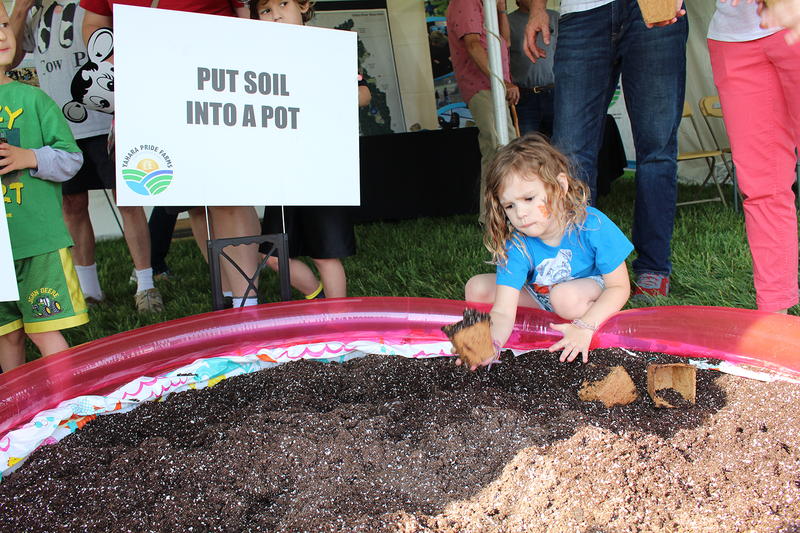 Child putting soil into a pot – Yahara Pride Farms provided a seed planting station where attendees could plant their own seed and take it home with them. Farmers protecting water quality tent – Yahara Pride Farms and the Farmers for the Upper Sugar River provided an educational exhibit at Dane County Breakfast on the Farm.